Created by Mackenzie Berry, Poet. Produced by IDEAS xLab as part of Project HEAL. Medical Mistrust, a study created by a medical student exploring trust between two adjacent communities. One is a health sciences campus. The other is a low-income Black community. Both take unique approaches to exploring the roles of trust and language in creating healthy, just communities. 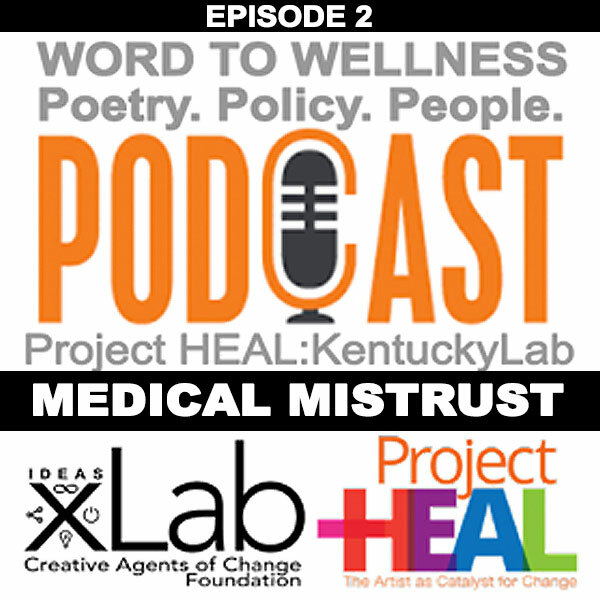 Word to Wellness: Health Access in Kentucky from Smoketown to Jackson is a podcast that uses poetry, first-person interviews, and media from YouTube, Vimeo, social media and online resources to develop new insights into Kentuckians shared cultural narrative around health access. It asks, “How does language impact health?” The podcast is focused on Kentucky's oldest African American community, Smoketown, and the rural, Appalachian, white community of Jackson, Kentucky that was the focus of the New York Times best-seller, Hillbilly Elegy. The project pairs poetry with policy to demonstrate how the two inform each other, driven by the quote from scholar Anthony Black, "Artistic revolution manifests when people can’t feed their children." Click on the images below to listen to the podcast episode. Word to Wellness was created by Mackenzie Berry. Mackenzie is a poet and policy intern at IDEAS xLab. Originally from Louisville, KY, she is now a full-time artist scholar in the First Wave Hip Hop & Urban Arts Program at the University of Wisconsin - Madison majoring in English - Creative Writing with a Certificate in Afro-American Studies. Additionally, she is a Wisconsin Idea Fellow, Center for Public Humanities Undergraduate (HEX-U) Fellow, and a Sophomore Research Fellow. In 2015, she founded the 501(c)(3) nonprofit organization Young Poets of Louisville. Mackenzie has served as Poet Laureate of Thrivals 8.0 of the Louisville IdeaFestival and has been featured on NPR for her work. She creates narrative work, written or otherwise. Word to Wellness is produced by Theo Edmonds and IDEAS xLab. IDEAS xLab intentionally crafts an approach that puts artists working together with healthcare professionals. Beginning Spring 2017, we are excited about a new partnership that will activate new thinking around health equity and social justice by pairing artists together with medical students at the University of Louisville in The Health and Social Justice Scholars Program.